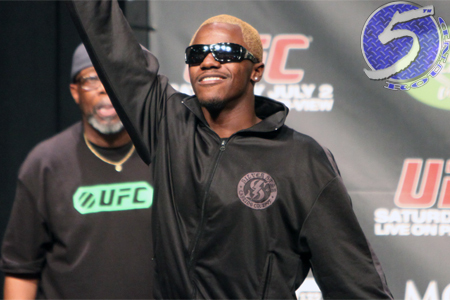 Everyone expected a shootout between lightweights Melvin Guillard (pictured) and Ross Pearson at UFC Fight Night 30. However, nobody thought it would end abruptly in controversy. Guillard was on the attack early, landing several strikes when Pearson’s back was against the cage. Referee Mark Goddard brought the assault to a halt when Guillard unloaded two questionable knees to Pearson’s dome. After the replay was shown several times in super slow-mo, it turns out the first knee was legal, but the second one was not. That strike is the one that created a nasty gash on Pearson’s forehead, which ultimately caused the bout to be ruled a no contest. In MMA, it’s illegal to knee or kick a grounded opponent in the head. To be considered grounded, a fighter’s knee or hand must be on the canvas. Pearson’s left hand was touching the mat when the second blow was delivered. The UFC has been discussing removing the “tripod” rule from the books. UFC president Dana White claims fighters are manipulating the rule and “playing the game” by putting their hand on the ground to avoid damage. I’m not saying that’s what Pearson was intentionally doing in this specific case, but maybe this scrap will force implementation.